This magnificent banana cake has found its way to our kitchen via our dauhters godfather. The cake is best served a couple of days after baking. You can prepare it in any kind of cake mold. 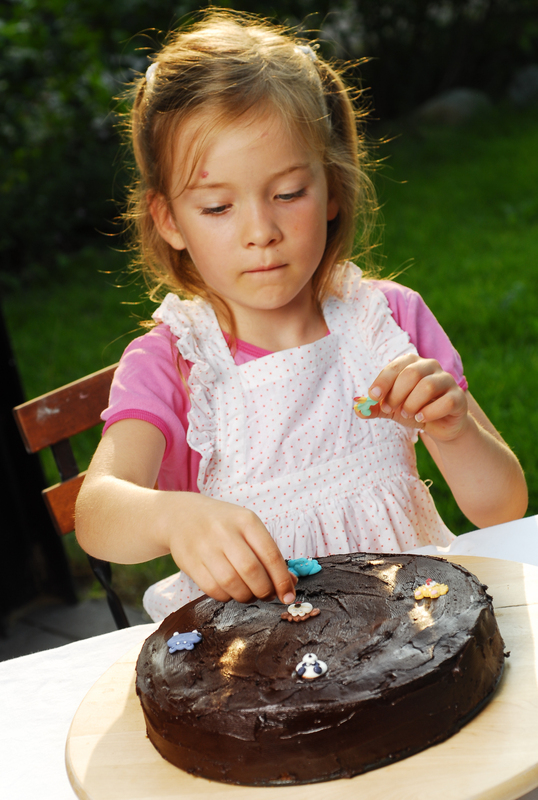 When it comes to decorating the cake… give the sous-chef all the creative freedom! so that it has time to soften. Peel the bananas. mush them with a potato masher or fork. Break the eggs into a bowl and add them to the butter and sugar mixture. Add the crème fraîche and the mashed bananas to the batter. or with a stick of butter or shortening wrapped in baking paper. breadcrumbs are distributed evenly all over the mold. Carefully mix all the dry ingredients together with a spoon. Chop the chocolate into small pieces in a food processor or with a bread knife. Mix in all the dry ingredients into the cake batter, then fold in the chopped chocolate. Pour the batter into the mold that the junior chef has greased and lined with breadcrumbs. baking paper halfway through so that the surface doesn’t burn. Melt the chocolate in a water bath or in the microwave. Add the butter one knob at a time while the grown-up does the mixing. and spread it on the cake.